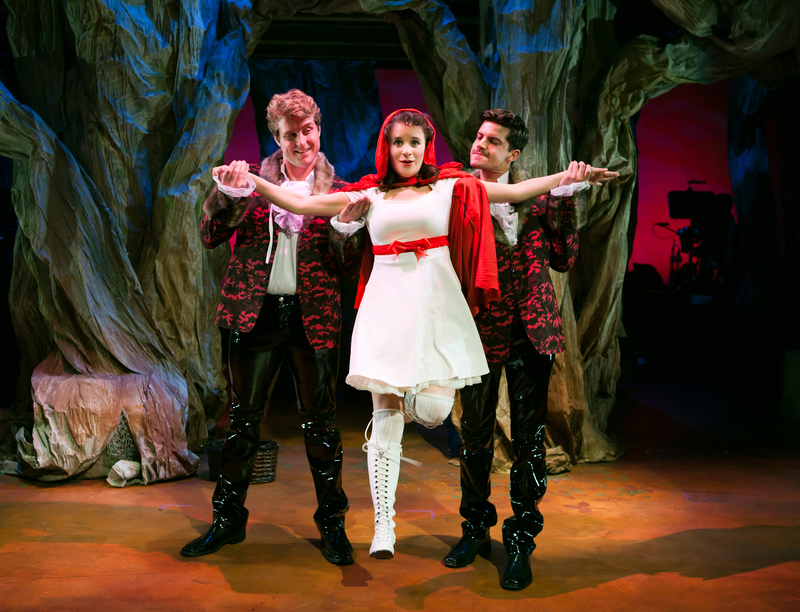 Wolves (Ryan McCrary and Jeffrey Brian Adams) meet Little Red Ridinghood (Corinne Proctor) in the woods. Photo Credit: Jessica Palopoli. We all know the stories of the Brothers Grimm: Cinderella marries the Prince (and lives happily ever after). The evil witch imprisons Rapunzel (and gets her comeuppance). Jack climbs the beanstalk and kills the giant so he and his mother can live — how else? — happily ever after. Little Red Riding is as innocent as the day is long. Etcetera. Right? Well, all of this is famously not quite so in Sondheim’s rather wicked musical take on the tales, ‘Into The Woods”. Here the stories intertwine, and are informed by Sondheim’s patented cynicism and ear for moral complications. Spice up the stories with a musically sophisticated score (well-served in this production by both singers and orchestra), and challenging, witty lyrics. Let director Susi Damilano and choreographer Kimberly Richards stir it up to a fine froth and season it with a company of skilled singer-actors. What you get, if not a life time of happily-ever-after, is at least one night’s worth of glee. 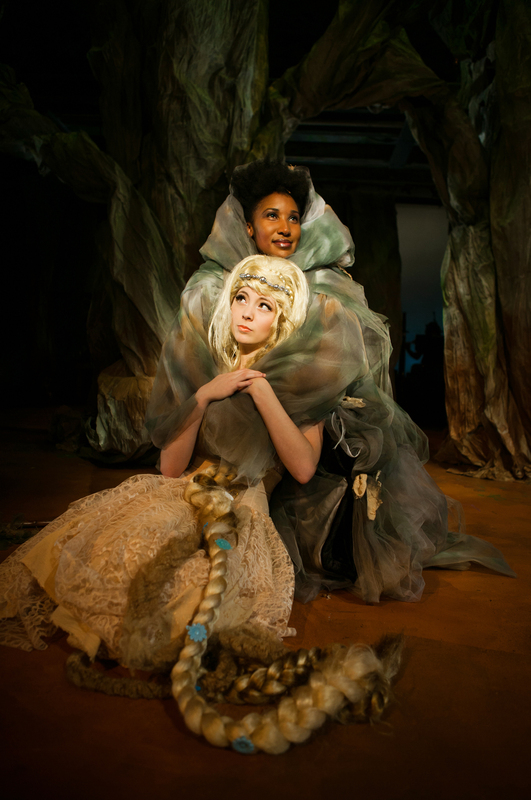 Rapunzel (Noelani Neal) is comforted by her “mother” the Witch (Safiya Fredericks). Photo Credit: Jessica Palopoli. Every member of the excellent company serves this piece well. Here are a few standouts: El Beh, as The Baker’s Wife, standing tall for equality. Corinne Proctor’s self-centered Little Red Ridinghood, a rather nasty bit of goods to begin with. Safiya Fredericks as a witch who is full of surprises and depth of feeling, leading us down unexpected pathways. Tim Homsley as a sweet voiced, sweet faced, sweet idiot of a Jack. And Jeffrey Brian Adams and Ryan McCrary doing dual service as creepy bro princes and dastardly forest wolves who will make your skin crawl. Sondheim fans will find plenty of cause to rejoice. 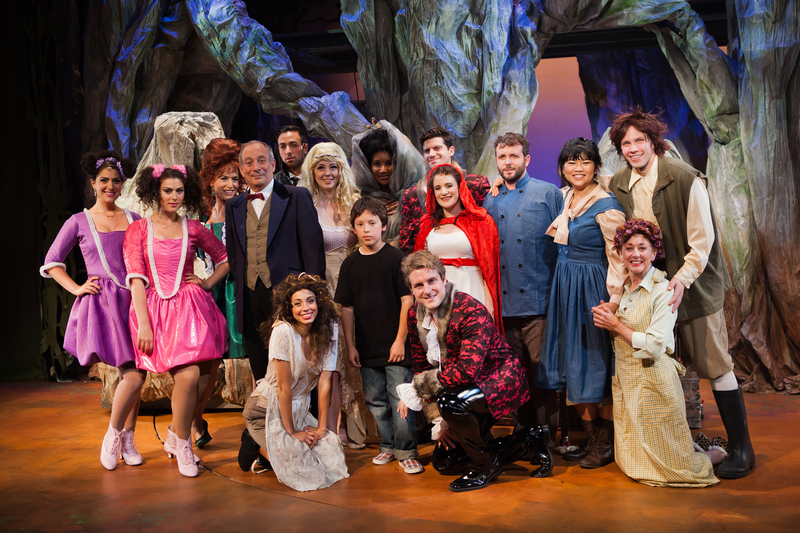 “Into The Woods” , music and lyrics by Stephen Sondheim, book by James Lapine. Produced by San Francisco Playhouse. Director: Susi Damilano. Musical Direction: Dave Dobrusky. Choreography: Kimberly Richards. Set Design: Nina Ball. Lighting Design: Michael Oesch. Sound Design: Theodore J. H. Hulsker. Costume Design: Abra Berman. Wig Design: Tabbitha McBride. Props Artisan: Jacquelyn Scott. Cinderella’s Prince/Wolf: Jeffrey Brian Adams. The Baker’s Wife: El Beh. Boy: Ian DeVaynes. Lucinda: Lily Drexler. Florinda: Michelle Drexler. Stepmother/Cinderella’s Mother: Bekka Fink. Witch: Safiya Fredericks. Steward: John Paul Gonzalez. Cinderella: Monique Hafen. Jack: Tim Homsley. Rapunzel’s Prince/Wolf: Ryan McCrary. Jack’s Mother/Granny: Maureen McVerry. Rapunzel: Noelani Neal. Narrator/Mystery Man: Louis Parnell. The Baker: Keith Pinto. Little Red Ridinghood: Corinne Proctor. Piano/Music Director: Dave Dobrusky. Clarinet/Flute: Nick DiScala or Terry Halvorson. Flute/Clarinet Bassoon: Audrey Jackson or Carolyn Walter. Trumpet/Horn: Jason Park or David Campbell. Percussion: LIly Sevier or Andrew Maguire. Violin: Lucas Gayda. Cello: Andres Vera or Ami Nashimoto. Musical Consultant: Dave Möschler. Posted in Reviews.Tagged Abra Berman, Bekka Fink, Charles Kruger, Corinne Proctor, Dave Dobrusky, El Beh, Ian DeVaynes, Into The Woods, Jeffrey Brian Adams, John Paul Gonzalez, Keith Pinto, Kimbery Richards, Lily Drexler, Louis Parnell, Maureen McVerry, Michael Oesch, Michelle Drexler, Monique Hafen, Nina Ball, Noelani Neal, Ryan McCrary, Safiya Fredericks, San Francisco Theatre Reviews, SF Playhouse, Stephen Sondheim, Susi Damilano, theatrestorm, Tim Homsley.